Carter's Lodge - La Lucia Accommodation. So conveniently situated,La Lucia Mall and Virgin Active Health Club; as well as being just minutes away from the beaches of La Lucia and Umhlanga. Durban, the ICC and Sun Coast Casino is just 10 minutes drive, while Durban's International Airport is easily accessible and only 20 minutes away. Restaurants and pubs can be found just around the corner whilst several golf club, tennis courts and the Virginia Airport are nearby. For the more adventurous, microlighting, scuba diving and fishing activities are offered in close proximity and arrangements can be made. For those special sports events, Carter's is also conveniently situated for the ABSA (Kings Park) Stadium; Kingsmead Cricket Ground; and Greyville Race Course. 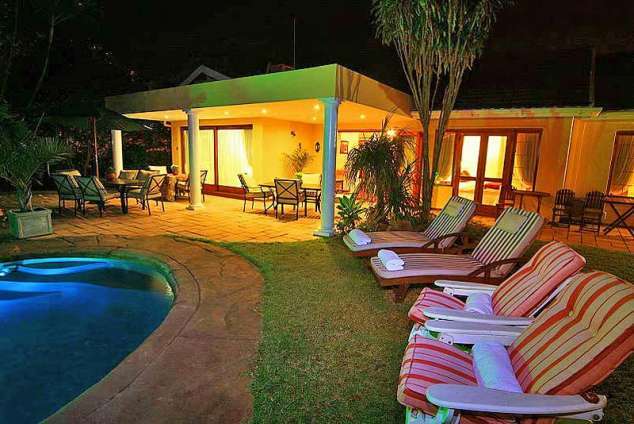 Although situated in the heart of La Lucia, Carter's Lodge offers peaceful surroundings - one can sit back and enjoy sundowners on the patio whilst watching the ships out at sea. Elegantly decorated, but with a warm and friendly atmosphere, there are three bedrooms all en-suite and with their own private entrance. Each room has TV with M-Net and selected DSTV, tea and coffee facilities, hair dryer, ceiling fans and air conditioning. The owners/ management have made comfort and cleanliness No.1 priority at Carter's Lodge with 100% Percale Linen, top quality towels in every room and all the little extras that go towards making your stay most enjoyable. A generous Continental and English Breakfast is served either in the elegant dining room or on the patio in the tranquil garden. There is secure, off-street parking and, for the businessman, a fully-equipped office is situated on site. Secretarial and laundry services are offered for a minimal charge. Restaurant bookings and food delivery services can be arranged. 57771 page views since 12 Aug, 2003. Last updated on 08 Feb, 2018.